Today the buzz around World War One and its Centenary is all for Italy entering the war. It was exactly a century ago on the 24th of May. It's propably silly to live today this remembrance time frame as a repetition of what happened one hundred years before. At the end of day, it's the logic of mass and social media mixed with the one of celebration or commemoration. We're not saying that all commemorations or celebrations are pointless, otherwise we should rapidly admit that even this site is totally meaningless (on the other side we're not praising it, but we believe that at least some contents that we post from here can make sense). So what to do in such a day from our outpost? Basically we think we can suggest two things. The first is a book by Gian Enrico Rusconi. Its title is L'azzardo del 1915. 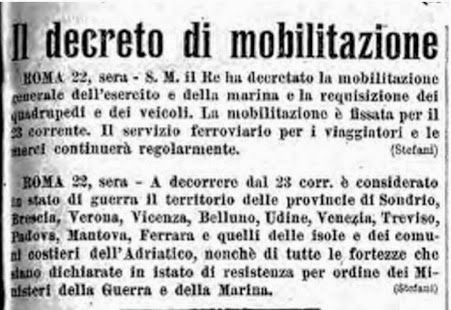 Come l'Italia decide la sua guerra ("The Hazard of 1915. How Italy Decided Its Own War"), a compelling and detailed analysis of ten months of Italian neutrality and about all the whirling games of the diplomatic corps. As far as we know, this book has not been translated into other languages. We strongly support its translation in case people are really interested in understanding the role of Italian neutrality and the meaning of the breakage of the alliance between Italy and the Central Powers. 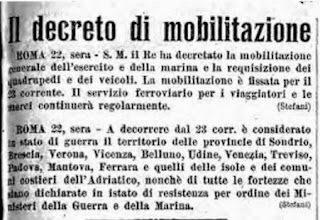 Secondly, for this day that gave the name to many streets in Italy, we were thinking to offer a selection of Italian First World War songs. People around the world, when asked about Italian people and what they can do, they usually say or think that they are good at singing (like many others are). The one below is just a selection of some popular war songs like the ones that all belligerent countries had. A site where you could grab some interesting *.mp3 of Italian songs is this "repository". Our selection of today includes only six of these.